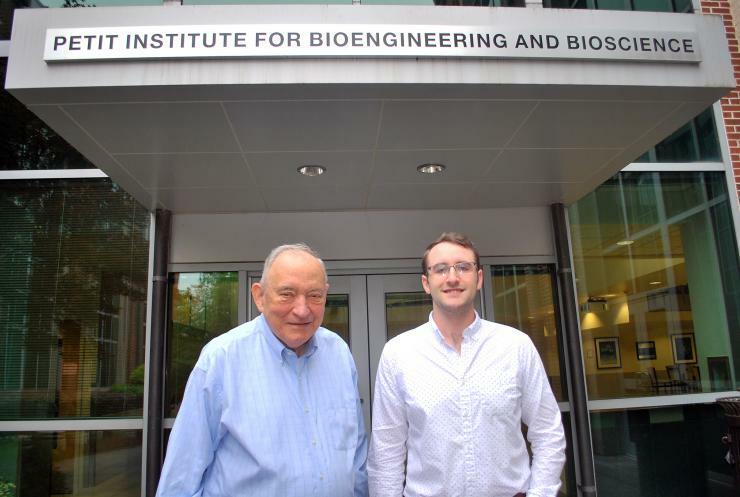 Jackson Hair, a graduate student in the Wallace H. Coulter Department of Biomedical Engineering at Georgia Tech and Emory (BME), is the 2017 Nerem International Travel Award winner. Hair, who also earned his undergraduate degree in BME at the Georgia Institute of Technology, is a second-year Ph.D. candidate advised by John Oshinski, associate professor of BME and a researcher in the Petit Institute for Bioengineering and Bioscience, known for his thought leadership in advancing MRI (magnetic resonance imaging) technologies. The Oshinski team’s research is specifically focused on developing techniques to improve the diagnosis and treatment of cardiovascular disease, and that’s why Hair will be using his award to travel to Switzerland, where he’ll study with the experts at the University of Lausanne’s Center for BioMedical Imaging (CIBM). Cardiac catheterization is the traditional diagnostic test to look at the heart and blood flow, but for the past 15 years or so, researchers have been working to perfect MRI for cardiac diagnosis. Basically, it’s a noninvasive procedure that lasts only 30 minutes – no catheter threading its way to the heart by way of an arterial puncture, and none of the small risks associated with catheterization. So he plans to take what he learns in Switzerland at the CIBM, which is directed by one of the world’s leading imaging experts, Matthias Stuber, and apply it to his research at Georgia Tech and Emory, repeating a pattern of knowledge-sharing that has become a traditional component of the travel award program. Previous awards have sent trainees from Georgia Tech across the planet, to some of the world’s top research universities and institutions, including the Karolinska Institute (Sweden), the RIKEN Brain Science Institute (Japan), the National University of Singapore, the University of Twente (The Netherlands), Queensland University of Technology (Australia), and the Max Planck Institute (Germany), among others. The program, which began in 2005, was created by friends and colleagues of Bob Nerem, the Parker H. Petit Distinguished Chair for Engineering in Medicine and Institute Professor Emeritus, as well as founding director of the Petit Institute. They established an annual award of up to $3,000 to support post-docs and graduate students traveling outside the U.S. for research.